Connecticut's budget process can seem intimidating, but it needn't be. The budget drives most of Connecticut's state policies, especially in health care. Advocates are well advised to pay attention and learn the basics. We've designed this page as a series of answers to Frequently Asked Questions. Beginning advocates should read it through from the beginning. More experienced advocates can skip ahead to specific answers by clicking on the question. Why do I need to know about the state budget process? Programs run on money, especially health care. If you want to understand the government's priorities -- don't listen to speeches, don't look at bills, look at the budget. If policymakers are serious about something, it will be in the budget. One of the classic advocates' mistakes is to work for years getting a bill passed, only to find that it isn't implemented because the state didn't dedicate any money for it. Connecticut's state budget is over $15 billion for the 2005/2006 fiscal year - that is $4,371.43 for every man, woman and child in our state. The budget defines how that money will be spent (and where it won't be spent). These are your tax dollars - you pay for the programs and you elect the people who make the decisions. You have both a right and a responsibility to make sure that those dollars are spent according to your needs and your values. The state budget is not a far-removed, academic exercise. It affects your life and your health in very concrete and tangible ways. The state budget determines how much is spent on hospitals, clinics for the uninsured, who will get HUSKY coverage and how much it will cost families, inspectors to ensure that quality standards are followed in nursing homes and group homes, licensing your doctor, rates paid for health care services, resources to help you navigate managed care, testing for environmental hazards, spraying for mosquitoes carrying the West Nile Virus, schools to train nurses, doctors, dentists, and a thousand other important issues that affect your personal health. OK, let's be honest. Budgets are boring. Most of us had to be dragged kicking and screaming into learning the budget process ("We are trying to save the world, why are you bothering me with numbers? "), but it's easier than you think. It may seem complex, but that is only because so much of it is hidden from the public. Just knowing that secret is powerful. The budget itself is contained in a bill, the "budget bill". The budget bill contains the numbers, the dollar amounts for state spending and revenues. But that only tells part of the story. A series of bills called "implementers" describe how the money is to be spent and how cuts are to be made. For example, the 2005 budget bill HUSKY line item included a $39 million increase from the year before. The Dept. of Social Services implementer bill described that the money was for an expansion of HUSKY to low-income parents. The budget bill follows the same route through the legislature as other bills, with a few special twists. In odd numbered years, the Governor and the General Assembly pass a two-year budget plan. But they make so many changes in even-numbered years, that it is essentially new every year. 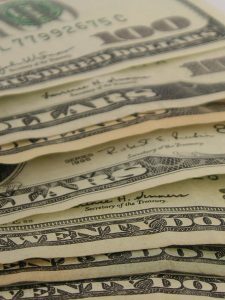 The state's fiscal year runs from July 1st through June 30th of the next year. The budget process is essentially year-round. In the summer and fall, agencies determine what they will need for the next fiscal year to continue their work, both to continue current service levels and "options" for program changes or expansions. These recommendations are sent to the Governor's budget office, the Office of Policy and Management (OPM), in late fall. OPM estimates what state revenues will be for the year, meets with agencies to review and modify their requests to fit with the administration's priorities, and puts it all together into a proposal to the Governor. In early February of the next year, the Governor submits her budget to the legislature. For the Governor's 2006 budget proposal, click here http://www.opm.state.ct.us/budget/2006-2007Books/2006-2007GovBudget.htm . The spending side of the proposal goes to the Appropriations Committee, the largest committee in the General Assembly. The budget is then divided again by content area and sent to the Appropriations Subcommittees. For health care issues, the relevant Subcommittees are Health and Hospitals (budgets of the Departments of Public Health, Mental Health and Addiction Services, and Mental Retardation, Office of Health Care Access and Office of the Chief Medical Examiner) and Human Services (mainly the Department of Social Services - Medicaid, HUSKY, and other services). Just like other legislative committees, the full Appropriations Committee and each Subcommittee have two chairs each, a Senator and a Representative from the majority party of each house. The tax and bonding side of the Governor's budget proposal goes to the Finance, Revenue and Bonding Committee and its Subcommittees. Unlike the federal government, the state has to balance its books every year by law (or at least it cannot build in a deficit). This means that the Appropriations Committee spending bottom line must equal the Finance Committee's revenue estimates. Since they rarely do, legislative leaders must work with the Governor to balance the two, adjusting spending and/or changing revenues. The final budget bills are voted on by both houses of the General Assembly, usually very near the end of the session, and the bills go to the Governor. In some years, there has not been enough time to finish the budget before the Constitutional session end date and legislators had to come back in Special Session to work it out before the fiscal year begins July 1st. For the final 2006/2007 budget, go tohttp://www.cga.ct.gov/2005/act/Pa/2005PA-00251-R00HB-06940-PA.htm. And everyone takes a breather for a couple of weeks before it begins again. Once it passes, is the budget set in stone or can there be changes? It changes all the time. During the year, the Finance Advisory Committee (FAC) can approve transfers of money within an agency to cover a deficiency. Medicaid almost always runs a deficiency and money often has to be "FACed" over from other parts of DSS' budget to cover it. The FAC includes the Governor, Lieutenant Governor, Treasurer, Comptroller, and two Senate members and three House members (split between parties) of the Appropriations Committee. The legislature also passes a "deficiency bill" during the session to cover changes to the budget necessary to get through the current fiscal year. What happens if revenues drop or expenses are higher than expected and the state is running out of money? During the fiscal year, if the state is facing unexpected shortfalls between revenues and expenses that cannot be accommodated through transfers (as occurred in late 2001) the Governor has the authority to cut individual budget line items up to 5% (not to exceed 3% of the total General Fund) without legislative approval. The FAC can approve slightly larger cuts. Significantly larger cuts need the approval of the full General Assembly. In November 2001, the legislature held a Special Session to make cuts. Cuts through the General Assembly and the FAC happen in public processes; the Governor's cuts do not. Surpluses from a prior year, if they are not spent, go to replenish the Rainy Day Fund (see below) and then to reduce the state's debt. However, in recent years after the Rainy Day fund was filled completely, most of the remaining surpluses were spent. Some went to pay for projects that the state would have otherwise borrowed for (e.g. school construction, buying land for open space), but some was spent on regular operating expenses (e.g. Medicaid). What is the General Fund? Does all the state's money go through it? Over 90% of the state's money goes through the General Fund - what most people call the budget. Almost all funding for health care goes through the General Fund. The Insurance Department is financed through a separate fund of about $22 million collected in fees from insurers. How much federal money comes through the state budget and who decides how it is spent? Connecticut gets about $2.6 billion in federal funds administered through state government each year. Over half of this comes as 50% or more reimbursement for Connecticut's Medicaid and HUSKY spending. The state has wide authority to administer these programs, within federal guidelines and subject to oversight by the federal Centers for Medicare and Medicaid Services. Some federal money comes to the state as block grants that require no state matching funds. Block grants are administered by the state for various purposes, under fairly loose federal rules go through the General Fund , and the spending plan must be approved by the relevant legislative committees. Public hearings are held on the spending plans for block grants. For example, the Maternal and Child Health block grant is a little under $5 million for 2006, is administered by the Department of Public Health and is spent on maternal and child health preventive and primary care services and services for children with special health care needs. Fiscal notes are brief reports drafted by OFA for every bill and amendment that is considered by the General Assembly. Fiscal notes estimate the costs or savings to the state and municipalities if the measure passes. A high cost fiscal note is a common way to kill a bill. Some OFA analysts are thoughtful and through in their estimates, but some just take the affected agency's figure at face value. Advocates can try to provide OFA with data supporting their case, but there is little that can done about bad fiscal notes. While analysts are nonpartisan, that doesn't mean they don't have an agenda. For an example of a fiscal note, click herehttp://www.cga.ct.gov/2005/fn/2005HB-06438-R00-FN.htm. The Rainy Day Fund is a hedge against bad economic times. It can hold up to five percent of net General Fund appropriations to cover unanticipated deficits. Any end of year surplus goes to replenish the Rainy Day Fund first. In early 2002, Connecticut emptied the entire $595 million Rainy Day Fund to cover declining revenues. What is the spending cap? 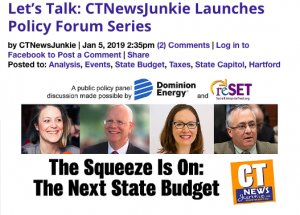 The 28th amendment to the Connecticut constitution limits growth in state spending to the greater of the five-year average increase in either Connecticut's personal income or inflation. The cap passed in November 1992, as part of the deal to institute an income tax. The idea was to ensure that policymakers do not overspend during good economic times, and over the surpluses of the late 1990's it largely worked. 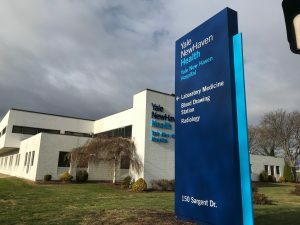 Unfortunately, the flip side of that success is that many worthy investments in Connecticut's health that the state could afford, did not happen. For more on Connecticut's spending cap, go to the Connecticut Health Foundation's report Connecticut's Spending Cap: Questions and Answers. What is bonding and how is it spent? Bonding is the state's borrowing that is intended for long term costs, such as land acquisition, economic development projects, building construction and repair. In 2006 Connecticut will borrow $1.5 billion in new funds. Currently, Connecticut owes $12.7 billion -- the highest per capita debt in the US at $3600 for each state resident. Interest on the debt will cost Connecticut $1.7 billion this year. Each year, plans for bonded projects are found in the "bonding package" of bills from the Bonding Subcommittee of the Finance Committee. The Subcommittee holds public hearings on proposed items. The bonding package is usually voted on by the full General Assembly near the end of the session. However, even if a project is in a bond bill that passes, it must still be authorized for spending by the Bond Commission. The Commission meets monthly and has both legislative and executive branch members. However the Commission's meeting agendas are set by OPM . If a project doesn't get on the agenda, it doesn't come up for a vote, and it doesn't get funded. For more on the bonding process and to search Bond Commission agenda items, visit the Comptroller's Bond Allocation Database. Where are budget policies and direction described? The budget implementer bills describe a lot of the policies. The "back of the budget" is language literally at the back of the budget bill describing how parts of the budget are to be implemented. After the budget passes each year, OFA publishes it on-line at http://www.cga.ct.gov/ofa/Documents/OFABudget/2005/Book/OpenBook.htm. What offices are involved in creating and implementing the budget? The Governor is critical. She is involved throughout the process, from proposal to implementation. The Governor is popularly elected by the voters every four years. The Office of Policy and Management (OPM) is the Executive branch's budget office, answering to the Governor. The Governor appoints the Secretary of OPM, with approval from the legislative Executive & Legislative Nominations Committee. OPM gathers agency budget requests, estimates revenues for the state, combines them in accordance with the Governor's policy priorities and drafts the Governor's budget proposal each year. None of these steps are part of a public process. OPM also administers some programs and dispenses grants for various purposes. OPM is also responsible for setting the Bond Commission agenda. The Office of Fiscal Analysis (OFA) is the legislature's budget office, working closely with the Appropriations and Finance committees. OFA drafts the final budget bills that are passed by the General Assembly and signed by the Governor. Parts of the legislature's budget process are public. Analysts are assigned by agency and subject area. OFA analysts are nonpartisan state employees who answer to the Office of Legislative Management. OFA also drafts a fiscal note for potential legislation estimating costs/savings to the state and municipalities upon passage (see above). The State Comptroller is the state's chief financial officer and she is in charge of keeping the state's books. The Comptroller publishes a "monthly letter" outlining the financial status of the state. She also publishes year-end reports required by statute. The Comptroller is popularly elected by the voters every four years. The State Treasurer administers the state's $20 billion investment portfolio, including retirement and trust funds for state employees and teachers. The Treasurer is also popularly elected every four years. The Auditors of Public Accounts assess the operations and effectiveness of state government. The two state Auditors, one Republican and one Democrat, are appointed by the legislature. The Auditors primarily check programs for legal compliance. For example, the Auditors conducted a performance evaluation of DSS and DPH regulatory processes for home health providers http://www.state.ct.us/apa/pdf2002/Home%20Health%20P1-03.pdf. How can I impact the budget process? Influencing the budget is not very different from influencing other legislation. First - prepare. Learn what is spent now, how it is spent, and who oversees the spending. If you want to propose a new program, estimate how much it will cost. Look at other states, see if Connecticut funds anything similar, look for an OFA fiscal note on a similar program, and get estimates from researchers and advocacy organizations. Be creative. For more ideas on research, see Research - Finding and Using Data. Meet with, write and call legislators, the Governor and any agency involved. Try to get your idea included in the agency's budget options sent to the Governor in the fall. Testify and/or submit written testimony to the Appropriations Subcommittee's public hearing on your part of the budget. Attend the hearing when the appropriate agency head testifies. Although it sounds impossible, monitor the backroom budget negotiations. It isn't as hard as you might think. If your issue is high profile, newspapers and other media may cover what is happening. If you are a member of or working with a group that has hired a professional lobbyist, they may be able to track your issue. If you have formed a relationship with a legislator, staffer or someone at an agency, they may be able to let you know what is happening. Write a letter to the Editor or an OP-ED for your paper about your proposal. Always remember to thank anyone who helps you at any stage. Take a moment to hand write a note - it makes a difference.